Cheat Seeking Missiles: Window Of Lost Opportunity? March through May could become the pivotal months of the entire U.S. war against Islamist terror in Iraq, because the al-Sadr militias could return to the battlefield after a long cease-fire in March, and the U.S. troop rotation that has fueled the Surge ends in May. 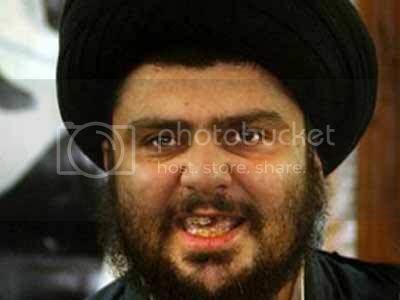 BAGHDAD (AP) - Radical Shiite cleric Muqtada al-Sadr has threatened to lift by the end of the week a six-month cease-fire widely credited with helping reduce violence in Iraq, officials said Wednesday. Sheik Salah al-Obeidi, a spokesman for al-Sadr in the Shiite holy city of Najaf, said that if the cleric failed to issue a statement by Saturday saying that the cease-fire was extended "then that means the freeze is over." The cease fire was declared in August and due to expire at this month's end. Al-Sadr's Mahdi Army is among the most powerful militias in Iraq. The crux of the message being sent by the organization was that al-Sadr followers would be free to resume their activities if no message was sent by the cleric on Feb. 23. The Sadr forces are angry about joint U.S.-Iraqi army actions against Shi'ite militia in the south of Iraq, far from the Sadr strongholds in and around Baghdad. If the Shi'a militia jump back in, fighting that could easily be peaking just as the Surge is scheduled to end. That glum scenario, if it becomes real, will certainly accomplish one thing: It will rip the election away from the economy and health care and back to the war in the months building up to the parties' conventions. Cuba Inching Closer To Freedom? Six-Word Slogans For America: Results!